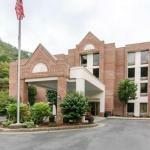 A free hot breakfast on-site fitness center and rooms with free Wi-Fi microwaves and mini-fridges are top features at the Comfort Inn Grundy located in the Appalachian Mountains of Virginia. The four-story hotel's 70 rooms offer free Wi-Fi cable TVs with HBO microwaves refrigerators coffeemakers and beds with Serta Sleeper mattresses. Non-smoking rooms are available. Get the day started with a free weekday newspaper and the free hot breakfast with eggs meat and waffles. Get in a full-body workout on the cardio and weight machines in the on-site fitness center. The hotel is on U.S. 480 along the banks of the Levisa Fork River. It's five minutes from the Appalachian School of Law and 10 minutes from the Appalachian Pharmacy School both in Grundy. Go bird-watching or hike the Grand Canyon of the South at Breaks Interstate Park about a half-hour away by car. NASCAR events are approximately 98 miles away at Bristol Motor Speedway. Tri-Cities Regional Airport in Tennessee is about 92 miles away; Charlotte/Douglas International Airport is approximately 243 miles away.